A Message-In-A-Bottle story in association with Camper & Nicholson. Written by Greg Powlesland. MARIGOLD; the incredibly unique Camper and Nicholson designed yacht launched in the late Victorian era – the golden era of yachting – in 1892. She survived the First and Second World Wars and was discovered in Wootton Creek, on the Isle of Wight in 1981. The classic houseboat treatment had left her in need of a complete rebuild and there was one man who’d dreamt that she would arise from a mud flat to provide such an opportunity. Greg Powlesland famously spent 7 years reviving this fine example of a Victorian 80ft (L.O.A.) gaff rigged gentleman’s cutter to her former glory. MARIGOLD’s restoration is considered to be the most sympathetic among the fleet, even today. Below, Greg, who continues his artistic journey through life – recently restoring the Camper and Nicholson designed PATNA (1920) with his wife Katie (née Fontana), recounts his experience sailing world-famous MARIGOLD in Cannes, the first time since her re-launch 23 years ago! Katie and I spent the summer of 2015 sailing our 1920 Camper & Nicholson yacht PATNA in the Mediterranean. Katie had to return to work in the UK after we had competed in the Monaco Classics and once we had gone on to sail along the coast to Villefranche-sur-Mer where I remained after she had returned home. As it happened, a little classic sailing event, the Régates de Nice – Villefranche-sur-Mer – Trophée Pasqui, was about to start there and PATNA was invited to join in. At anchor in the bay we had the pleasure of watching MARIGOLD sailing in under full sail, Jason, her skipper is not one to do things by half! As PATNA had no crew we came to an arrangement where the ‘Marigolds’ crewed PATNA every alternate day and I sailed on MARIGOLD the other days. This was great fun; a gentle sail in company to a beach restaurant, being wined and dined and then cruising back, washed by sea and warmed by late afternoon sun with further events in the evening all thanks to Pasqui organisation. We also met Jean-Yves Terlain; French off-shore sailor and pioneer of the world-famous circumnavigation singlehanded race, the Vendeé Globe’s launch in 1989. Now with his scull and crossbones-like embellished black 60ft yacht COLUMBUS – he’s an ambassador to Sea Shepherd, a marine conservation society that opposes threats to marine life across the world. After the event the fleet headed down the coast to Cannes, and as it was a light breeze I single-handed to anchor off the harbour. Jason had suggested that I helm MARIGOLD for a couple of the races of the Regate Royale (Tropheé Panerai) as PATNA was not entered for the regatta. 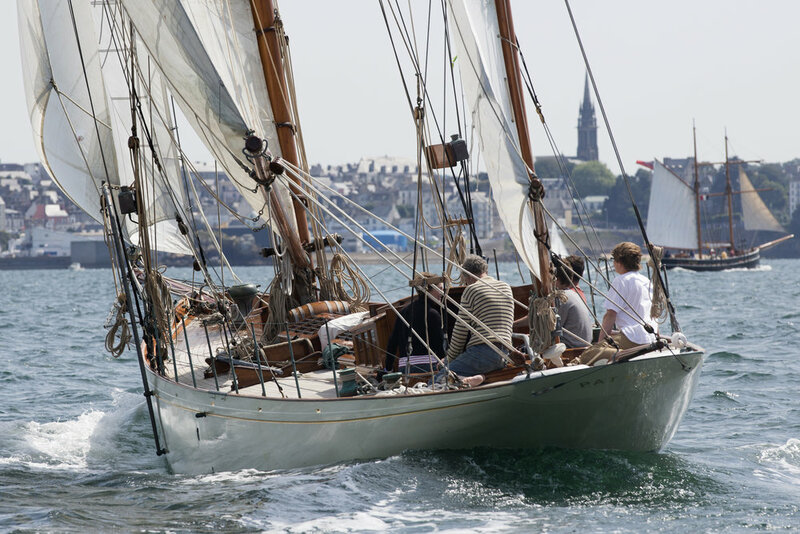 Jason had suggested that I helm MARIGOLD for a couple of the races of the Régate Royale Cannes (Trophée Panerai) as PATNA was not entered for the regatta. Having not had the chance to helm MARIGOLD racing since finishing the boat for her now previous and first owner after the rebuild Glen Allen, this was a privilege not to be missed. Sept 24th was a breezy day, a good wind – force 4 building with gusts of 6 in the afternoon. The big boats were all setup with jack yard topsails and there was a palpable sense of excitement as so often Med weather can disappoint with no wind or, wind force 1 or 2. Over several hours of racing the boats tend to spread apart but as the course is to be sailed round twice there are plenty of chance encounters with other vessels, some of which are considerably larger and therefore faster than ourselves, with yachts running under a vast press of sail including spinnaker and topsails and others tacking fast and close across one’s bow. Allowances for 20 foot bowsprit and 40 foot boom hung over the side, have to be rapidly judged, quite apart from wrestling with a yawing swell when surfing downwind at 11 knots as we were that day on MARIGOLD. This requires experience and team work. The skipper directs and judges tactics, the helmsman steers and the crew are stationed ready to adjust any rope required according to instruction and circumstances. It’s a fine tuned operation which works well with a skilled crew and an experienced and wily skipper like Jason, who started on MARIGOLD working on the rigging during the final months of our reconstruction over 20 years ago. During this race MARIGOLD was well matched with the 75 ft ketch VERONIQUE sharing some very competitive sailing. We would pass her on the run but she would creep past us on the tacks….. sometimes! On one leg we had a grand battle to windward with both yachts getting rails under with barely a boats length between them whilst thrashing forward at 9 knots hard on the wind. At nearly 40 Tons MARIGOLD is a heavy displacement vessel, very different in feel to a light, wave skipping contemporary yacht. The gear is massive, the boom long, and the helm takes an arm wrestler to shove that crescent moon edged rudder to leeward when skewing off a down wind swell. However she is well balanced and tremendously stable with a 12 ton lead mine balancing 2300 sq ft of sail on a 45 ft waterline requiring a real blow to get the lee deck under. Cutting to windward she answers the helm with a sense of crisp purpose, the strait narrow stem cleaving through waves confidently. But beware the huge momentum of that lead mine hull veering to the wind after running in a big sea. Half tide rock in a storm!!! I remember such an event on the similar Victorian yacht PARTRIDGE racing at Cannes years back. Emerging from the protection of a headland PARTRIDGE lurched headlong into a cauldron sea, plunging the Aussie bowsprit man deep under water to emerge still grinning but hanging on! The positive spirit of sailing is very much about the crew and regulars on MARIGOLD including masthead man extraordinaire Adam, who excelled at diving off the spreaders, Gabriela, who leaves her farm in Brazil during the summer, to sail as crew and Tigger who borrowed my camera to film from the counter as we tussled against VERONIQUE and of course Jason. As skipper and manager he has retained the boat as we restored it with cotton sails and no rope winches thereby fulfilling the original concept, to recreate the boat to answer the question. What was it like to sail on a Victorian yacht? Marigold is available to charter – visit her website here.